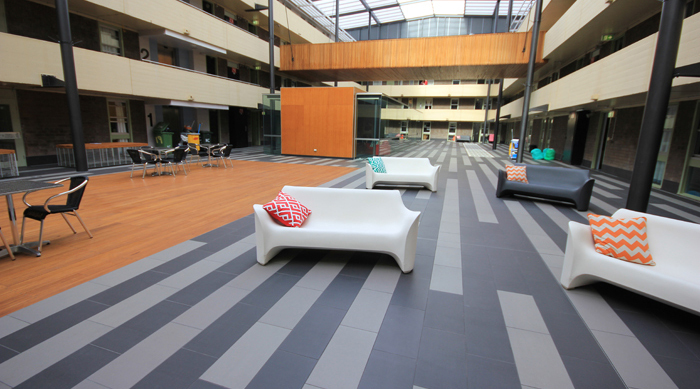 Surface Gallery has completed the supply of Living Serena and Living Black tiles to the recently refurbished New College at the University of NSW. Our specialist architectural representatives worked with the designers from Hassell Architects in the specification process to select the two complementary products, Living Serena and Living Black Tiles in a 600x300mm format. These tiles were laid in a linear pattern designed especially for this project by Hassell Architects. The Living Collection was selected for both it's durability and cost effectiveness, as well as providing a contemporary look. Click for more information and other colours available from the Living Collection.